This electrifying adaptation of Mel Brooks’ monstrously funny film will leave you in stitches (get it, “stiches”?). This musical re-imagining of the Frankenstein legend follows young Dr. Frankenstein (that’s Fronkensteen) and Igor (that’s Eye gor) as they attempt to create a monster, but not without scary and hilarious complications. "Young Frankenstein" is scientifically proven, monstrously hysterical entertainment – Mel Brooks style. Memorable tunes such as "The Transylvania Mania," "He Vas My Boyfriend" and "Puttin’ on the Ritz" add extra theatrical flair to the screen sensation. 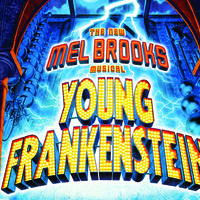 If you liked "The Addams Family" at the UDT you will love "Young Frankenstein!" Some language/mature subject matter. Menu: Chicken schnitzel (German-style breaded chicken breast) with lemon wedges, German fried potatoes, roasted brussel sprouts, dinner salad, dinner rolls, iced tea, coffee, Abby Normal’s famous German chocolate cake. Note: Shows on Oct. 14, 17, 18, 24 and 25 are discount dinner performances. The no dinner matinee performances are Oct. 21, 28 and Nov. 4. Children 3 years & under are not allowed in the theatre. ***Up to 4 with Valid ID **One ticket per valid UTEP ID.